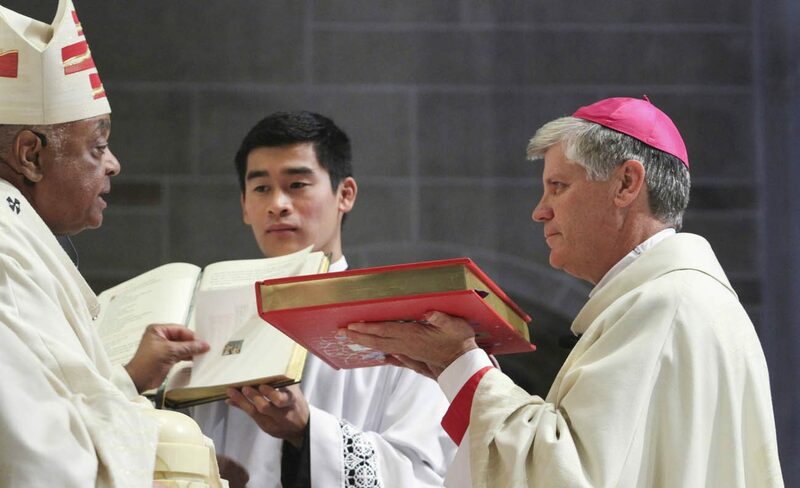 Archbishop Gregory ordained the priest of the Diocese of Raleigh, North Carolina, as auxiliary bishop during an afternoon Mass July 19 at the Cathedral of Christ the King in Atlanta. The 56-year-old new bishop, most recently the director of spiritual formation at St. Charles Borromeo Seminary in Philadelphia, will soon be Atlanta’s only auxiliary. Bishop Luis R. Zarama was named bishop of Raleigh July 5 and will be installed Aug. 29. More than 150 priests, 45 deacons and 50 seminarians from both Atlanta and Philadelphia attended the ordination Mass with Bishop Shlesinger’s family and friends. Bishop Zarama and Bishop Michael F. Burbidge of Arlington, Virginia, formerly the bishop of Raleigh, were co-consecrators with Archbishop Gregory in the laying on of hands and invoking the Holy Spirit. Archbishop Christophe Pierre, apostolic nuncio to the United States, and five other visiting bishops also attended the Mass. In his homily, Archbishop Gregory said Pope Francis has called bishops to remember they are mere men who must always seek out the lost and forgotten. “He challenges us to remember that the neglected, the unloved, and the unimportant ones are those whom Jesus sought out first in his ministry,” said the archbishop. Archbishop Gregory said it is obvious that Bishop Shlesinger is a gentle man, emphasizing the separate components of that title. “A gentle man is one who thinks more about others than he thinks about himself. A gentle man is one who sees the goodness of others before he sees their flaws. A gentle man is one who realizes that his own weaknesses must direct him toward mercy in reference to all others,” he noted. Archbishop Gregory said that even while attired in splendid robes, a bishop’s humanity must be the force drawing people to Christ. “People may be enthralled by the uniqueness of our vestments, but they must never be put off by any sign of self-importance or arrogance,” he said. “Our diversity is a strength that at times is also a challenge as we bishops must love each community and each person with our whole heart and remind each one that they belong to a single family of faith bound together through the Eucharist and united by the power of the Holy Spirit,” he said. Bishop Shlesinger belongs not only to the church of north and central Georgia but to the entire world because the Lord chose him for the mission, said the archbishop. The new auxiliary will soon visit his father, Bernard E. “Bill” Shlesinger Jr., in Virginia. The elder Shlesinger, who watched the ordination from his home, will be able to embrace his son for the first time as bishop, said an emotional Archbishop Gregory. “Please share with him the deep gratitude of Christ’s church for having helped prepare a man of faith for the church’s fullness of orders and to assure him of our prayers when you see him,” he said. Archbishop Gregory acknowledged that being a bishop is never an easy undertaking. “Whether we faced martyrdom or opposition, whether we became overly enamored of our own status or were too consumed by the cares of this world, we could always rely upon the grace of the Holy Spirit, which is the promise of this ordination ceremony and will be your anchor in faith for all the days that will ahead,” he said. In a rite from centuries past, the bishop-to-be is presented to the ordaining bishop and a letter from the Vatican confirming the authenticity of his election is read. Father Henry Atem, chairman of the priests’ council, presented the bishop-designate to Archbishop Gregory. Archbishop Pierre read the letter in English and Spanish. For his episcopal motto, Bishop Shlesinger chose “Christ Must Increase” from Chapter 3 of the Gospel of St. John. “We pray today that your well-chosen motto, ‘Christum Oportet Crescere,’ ‘Christ Must Increase,’ ever guides your episcopal ministry to the people of God in Atlanta,” said the nuncio. In his remarks before the final procession, the new bishop said the ring he received as a sign of his new office, along with the miter and crosier, was given to him by Archbishop Gregory. “The ring is a sign, like a wedding ring, of my marriage to the Archdiocese of Atlanta. So, I’m here to stay,” he said, to applause. The bishop’s crosier, which depicts Mary with the child Jesus, was a gift from the priests of Raleigh. The new auxiliary thanked his siblings, nieces and nephews for being there and grew emotional when speaking of his beloved parents. And, my dear mother. Somebody said to me, ‘She’s got the greatest seat in the house,’ and she’s looking down from heaven,” said Bishop Shlesinger.